There are many different ways to define “national debt,” however, most financials institutions count it as “general government debt.” Even within this common definition, there are many different definitions of what should be included in the national debt figures. The IMF counted the gross national debt to GDP ratio of Slovenia as 75.4% at the end of 2017. The country’s net debt to GDP ratio worked out at 49.1% at the same time. Gross debt counts all the money owed by a government through debt instrument issuances or formal loans. The net debt figure deducts all of the assets that the government owns. This only means financial assets — buildings and works of art are not included for these purposes. As a member of the EU and the Eurozone, its statistics are monitored by Eurostat. That organization valued Slovenia’s debt to GDP ratio at 73.6% at the end of 2017. Eurostat does not include guarantees written by the government for loans to others when it calculates a country’s debt. The OECD does include government guarantees in its debt figures and also the debts of state-owned assets. 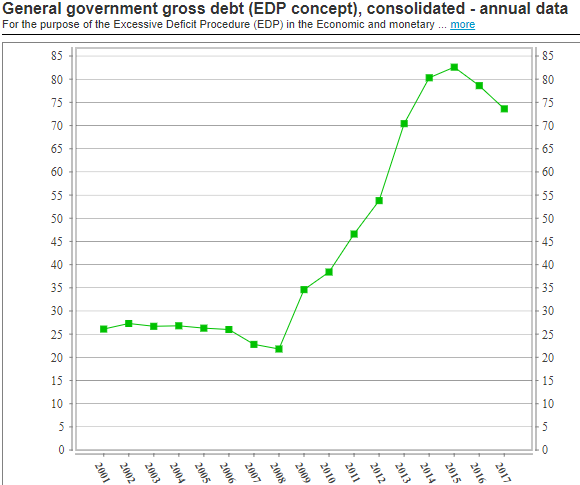 That organization calculated Slovenia’s debt to GDP ratio as 88.2%. A chart of the debt to GDP ratio of Slovenia during this century shows that country enjoyed very low levels of debt up to 2008. After that year, the national debt increased year after year from a low point of 21.8% in 2008, peaking at 82.6% (by Eurostat measures) in 2015. The net debt of the country is a lot lower than gross debt, by almost a third. This show that the government has accumulated a lot of financial assets while also quadrupling the national debt. Why? The lowest point in Slovenia’s national debt occurred in 2008. That date is significant because it is when the global financial crisis happened. Despite having a low debt ratio, the government of Slovenia has always run an annual budget deficit, as the chart from the OECD below shows. 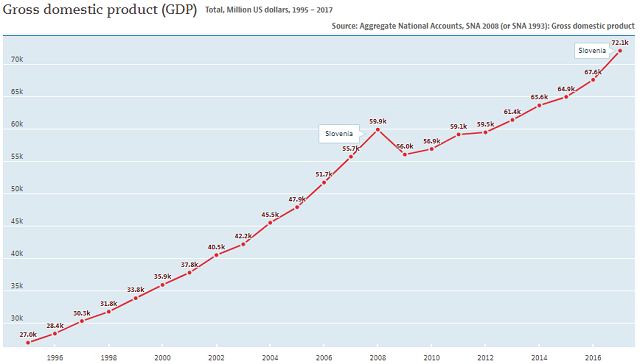 However, strong growth in the economy meant that even though the country ran deficits of up to 4%, its debt to GDP ratio still shrank because its GDP grew very quickly. When the financial crisis hit in 2008, many countries in the EU, particularly Ireland, Portugal, Spain, and Greece needed external help to solve the problem. State-owned banks formed a large proportion of the country’s banking sector, and so as the ultimate owned of troubled banks as well as the national guarantor to depositors, the government was heavily responsible for bailing out its own banks. The low debt to GDP ratio of Slovenia as well as the government’s previous habit of running annual budget deficits meant that the country had room to find money from its own resources to bail out its banks. The government of Slovenia tightened regular government spending to enable it to focus its debt-raising efforts on rescuing its banks. The government presented a credible bail out plan that included manageable debt and state assets sell-offs. The international trader community approved of the plans, and so, unlike Greece or Cyprus, Slovenia was able to continue to sell government bonds and finance its own recovery package. Who manages Slovenia’s national debt? The Ministry of Finance is responsible for planning the national government’s financial strategy. It created the Central Government Debt Management Department to directly manage the national debt. The Debt Management Department’s responsibility extend to trader relations and feedback to government ministers in order to keep the international financial community onside through the difficult times of recovering from the country’s banking crisis. This strategy helps to keep down the interest rates that the government has to pay on its debt. Debt raising is used in coordination with the sale of assets to cover the costs of recovery. For political reason, a strategy of using state assets to fund a bank bailout did not get underway until 2012. 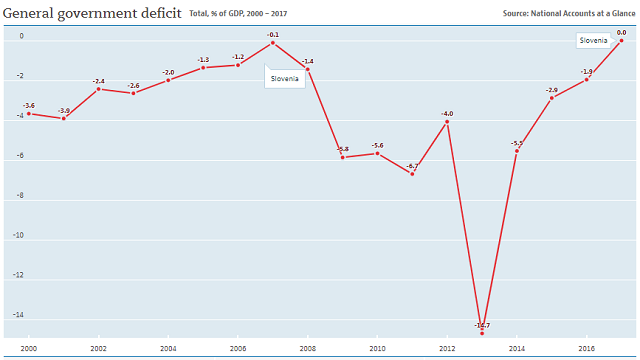 That is why the government budget deficit was particularly severe in 2013. The government created a bad bank to recapitalize the country’s banks, most of which were nationally owned. The delay in selling off state assets actually worked in the country’s favor. The value and saleability of state businesses have improved since the financial crisis passed. By putting forward a credible plan with an horizon of 2020, the Central Government Debt Management Department was able to keep traders buying government debt and laying plans for a staged sell off of government enterprises. This both kept required interest rates low and increased the income from asset sales when they eventually happened. Despite having gone through a very severe banking crisis, the country enjoys A-grade credit ratings, as shown in the table below. What facts should you know about Slovenia's national debt? You could wrap $1 bills around the Earth 166 times with the debt amount. If you lay $1 bills on top of each other they would make a pile 4,664 km, or 2,898 miles high. That's equivalent to 0.01 trips to the Moon.